The enterprise-wide deployment of a well-branded email signature is an essential component of an overall branding strategy. The reach is wide and is directed primarily to what is likely your most important audience - those with whom you have established relationships. Unfortunately, in many organizations, email signatures are still treated more as an afterthought than as the powerful tool they can, and should, be. Based on 18 years of experience, the following action steps are required to create, deploy, and maintain a great professional email signature program. In this article I will address each of these eight steps, providing a level of detail that should assist you in confidently moving through the process from start to finish. The only time you do not have a problem is when everyone is adhering to an email signature standard, and that standard is based on properly written HTML, designed in accordance with your brand guidelines, and the email signatures are correctly installed into the user’s email programs (Outlook, Gmail, iPhone, etc.). Achieving this, especially when you have more than a dozen users, will either require the assistance of an outside vendor, or a talented and patient internal IT resource. Getting the technical email signature equation correct is almost unimaginably complicated, and furthermore it’s extremely easy to be lulled into thinking that your signature is working well, when in truth, it isn’t. There’s also one problem that is not readily apparent - missing images. It is not uncommon for an email signature to be constructed in such a way that to the sender, the signature always appears perfect, but the recipient never receives the images in the signature. Even in a back-and-forth conversation, the sender may see his or her signature perfectly every time, whereas the recipient never sees it perfectly. This can go on for a long time before someone brings it to the sender’s attention. In conclusion, unless you’ve utilized a professional in creation of your email signature program, there’s a good likelihood that it’s operating at a sub-par level. This awareness leads to step 2 - valuing an email signature investment. The creation of a top-notch email signature program in your organization is going to require an investment either in time or money, and most likely in both. As in any investment decision, the questions are quite simply what’s it going to cost and what benefit is going to be achieved. Based on my experience it’s probably not feasible to attempt to implement an internal, do it yourself, solution if you have in excess of 50 users. The reason is that each user is going to require a customized HTML file (and, if Outlook is your email program, a customized RTF and TXT file). These customized files need to be distributed and installed properly to and by each user, possibly in multiple places - desktop Outlook, Office 365, iPhone, etc. Once this is done, changes will be required - people will come and go, names and email addresses change due to marriage, titles change, the signature itself changes - Instagram is added, etc. Taken as a whole, the management quickly becomes daunting. And all this is premised on a starting point of having someone capable and with the time and patience necessary to learn the ins-and-outs of email signature programming. If your organization is considerably smaller, a do-it-yourself approach is certainly more feasible, but again, this is premised on having someone available who can commit to the process of learning how to create and deploy email signatures properly. We offer one of the most comprehensive how-to guides available on the web. A quick glance at this document provides an understanding of the depth of knowledge required to properly execute an email signature program. If you turn to an outside vendor, it’s probably the old adage, “You get what you pay for.” I frequently see jobs posted on sites like Airtasker requesting an email signature and offering to pay $25. There’s frequently a misconception that website HTML and email signature HTML are the same thing. They are not. It is very easy to create an email signature that will look and work great in a browser. This is a task that is probably worth$25 and there are tens of thousands of people the world over that can do it. However, an email signature does not live and work in a browser - it lives and works in Outlook (MS Word - based), Gmail (browser based), Mac’s (Mac OS), iPhones (iOS), etc. Finding the one, happy medium across all of these takes a great deal of experience and testing, testing, testing! You don’t get this for $25 from someone on Airtasker. Nor, for that matter, do you usually get it from your web designer or graphics person. Vendors specializing in email signature services tend to charge a monthly or annual fee. Prices vary considerably, and perhaps more importantly, does the service provided. There are a number of approaches to providing email signatures, so it pays to do your research and shop around. Besides not requiring an explanation, no justification is needed for the cost of professional business cards, at least not for people who have face-to-face business interaction outside of your organization. When it comes to email, virtually everyone has interactions outside of their organization, and so allowing people to be sending what’s often the electronic equivalent of a scrap of paper with their name jotted on it is inappropriate at the least, and in actuality, downright unprofessional. A professional first, and lasting, impression created by the appearance of the emails emanating from your organization. Email messages adhering to your brand standards across all employees. Efficiencies when writing email messages in not having to spell out some basic information. Efficiencies for the recipients of your email messages in terms of reaching you by telephone, reaching your website, or navigating to your physical location. Compliance with any legally mandated or recommended disclaimers. Inclusion of any legally mandated employee-specific license numbers. A method of widely sharing links to your social media. A platform for making time-sensitive announcements - trade show appearances, holiday hours, new products or services, etc. More importantly than the individual benefits, is the cumulative effect that begins immediately upon launch of a well-crafted professional email signature program. If you launch your program at noon, the benefits begin accruing at 12:01 pm and never stop! Upon recognizing the value of an email signature program, it’s time to look for a vendor that can assist you. Note: If you elect to do it in-house, you may still find yourself looking for a vendor following weeks or months of false-starts. We’ve been called upon many times take over failed projects. Let’s take a brief look at all four of these. You are locked into using their pre-formatted templates, which may be okay for your needs, but will almost never be perfect. Each signature will need to be created from scratch, uploading your logo each time, resizing it each time, selecting fonts and colors from a palette each time, etc. Creating multiple signatures that are the same will become an immediate challenge. This type of vendor may be okay if you’re only creating a handful of signatures. Beyond this, it’s not likely a good solution. It’s very likely that your company already has a relationship with a web development firm and a graphic design firm. There’s also a reasonable chance that either of these may be willing to take on your email signature project. Despite the existence of your relationship, there’s a drawback. Email signatures are exceedingly finicky - many things that are taken for granted in HTML programming simply don’t work. Or, worse yet, they don’t work well - they work just enough for the vendor to believe that they are providing you with the final deliverable, but once put into day-to-day use problems soon surface. As with in-house projects, I have been called upon many times to take over partially completed projects attempted by web developers or graphic designers. There is one caveat here - using a graphic designer to design the signature - graphics, layout, colors, etc. - can be a great idea. The best looking and most unique email signatures I’ve ever created for customers of mine have been those that were originally designed by a graphic designer. Email signature software has been available for at least 15 years and has obviously undergone many changes since its inception. Initially there were two primary models - an Exchange Server product that appended the signature to the email as it passed through Exchange, and an online product that required all email messages to be routed through the vendor’s server, at which time the signatures were appended. This second approach created some legitimate security concerns. When considering this approach be aware that a significant learning curve is likely to be required. Most of these services will require dedicated IT resources to set up, and in many cases to maintain. 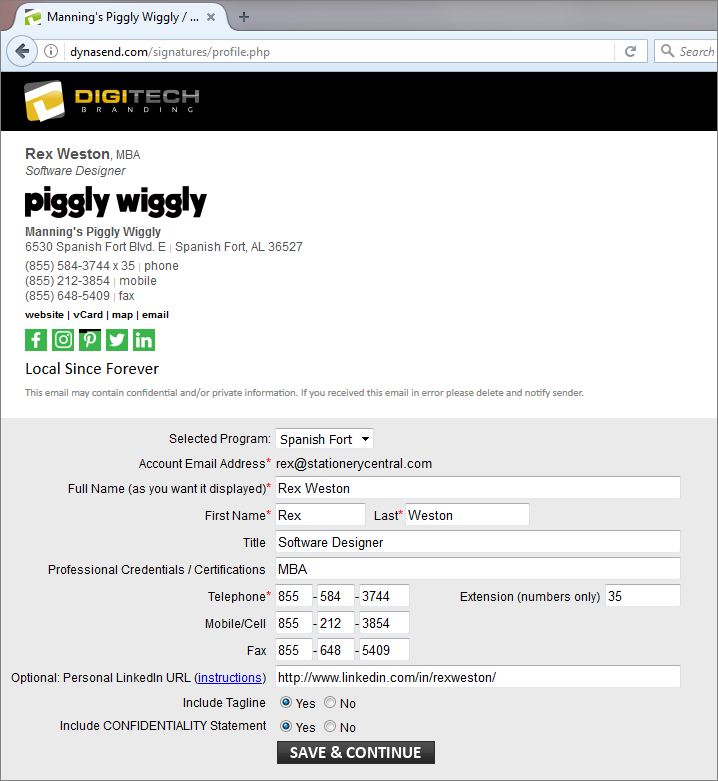 Furthermore, they will require someone to create the email signature HTML, whether directly or from a WISIWYG editor. On the plus side, these software approaches will provide you with the maximum flexibility and control over your email signature program. So, if you have the IT resources available, and are willing to make email signature management a significant ongoing job responsibility for someone, one of these approaches may be best for you. Automated installation and synchronization into Outlook / Office 365 via the same app but pushed remotely to all workstations via your IT staff (roughly a one hour task, done once). Manual install by users into Outlook, Mac Mail, Gmail, iPhones / iPads, etc. (roughly 3 minutes, one time). Automated appending to outgoing emails at the Exchange Server level following a one-time install of software on your Exchange Server by your IT staff (roughly 30 minutes, one time). If our customer wishes to bypass the need for users to complete the data entry form, we can upload an employee data spreadsheet to produce the initial batch of signatures in bulk. Addition of time-sensitive announcements - marketing promotions, trade show appearances, holiday hours, etc. Note: As an optional hybrid service, we do offer direct customer control over the addition of time-sensitive announcements via a very easy to use administrative interface. This full-service approach is well tailored to many environments. We have many customers in the 1 to 5 user range, but we also have customers in the 20,000+ user range. While we have customers with simple and straight-forward needs, we also have customers with extremely complex requirements, such as a PS line added to the signatures for Ameriprise Financial (via a drop-down menu) that consists of 32 options, some of which have multiple embedded user fillable fields. Our approach makes the most sense if you want to create an email signature program, but have neither the time or motivation to tackle a steep learning curve initially, and then to devote the time on an ongoing basis to managing the program. Signature design can be broken down into two aspects - layout and content. If you’re interested, I’ve written a useful blog post entitled “Dissecting an Email Signature’s Content” which provides an in-depth analysis of content considerations. Clearly only some of the above listed items will apply to your signature, and some of them that do apply may be rejected in order to keep the signature as streamlined as possible. After 18 years of experience and the creation of many thousands of email signature projects I can state that there is no right or wrong approach - ultimately the decision is up to you. One last thing in regards to content - your program should be set up to allow for optional content. Good examples of this include mobile phone number and personal LinkedIn link. Some users will want to include these items, others will not. The signature HTML must be designed in such a way that it will expand / collapse gracefully with the inclusion / exclusion of various optional content items. By providing users with options they feel an ownership for their signature, and are thus able to produce a signature that “fits” them but is still within the corporate standard. This is very important. If you do not provide users with the options they need, you will be besieged with no end of special requests by individual users. Following from your content decisions, you should have a good idea of what needs to be included in your signature. It’s best to lay out the design as if the user has included every optional element (with some thought given to how to have the signature collapse if the element is not included). Logos that have a horizontal orientation fit best in single column, “stacked”, designs. Logos that have a generally square orientation work the best in a multi-column layout, with the logo in one column and the contact info in another. The ultimate goal is to wind up with a finished signature of 650 pixels or less in overall width, while at the same time not being overly tall either. If you can accomplish this, you will have a signature that renders well on smartphones while looking smart on computers. It’s always a compromise between the two, but there’s a clear rule of thumb - readability and the sharing of necessary contact information is priority number one, with the visual aesthetic always being secondary. Once you’ve got the signature designed, you’ll be ready to populate the signatures - that is, you’ll be ready to produce the finished signature files that will be in use by each of your individual users. The way you go about this will depend largely upon the number of users you have and what email program they use to send email. If you’ve got fewer than 50 users, it’s feasible, though not fun, to prepare 50 individual HTML files, each bundled with corresponding RTF and TXT files. Note: If your users are not using Microsoft Outlook then you only need to prepare the HTML version. The best way of doing this is to start with a master file that contains every possible content item. Create this, install this, and test it. Once you’re satisfied with its performance, you can then clone this master for each individual, carefully removing unneeded content items accordingly. Here’s a link to an article I wrote entitled, “Designing, Coding, and Deploying HTML Email Signatures - Technical Considerations” - this provides a solid overview of the technical task at hand. [name] / [title] ABC Manufacturing, Inc.
Outlook will “embed” the logo and any other images in the signature, resulting in unwanted attachments when emailing back and forth with someone using an iPhone or iPad. These embedded images will be inflated in size and become pixelated whenever someone’s “Windows Display Setting” is above 100% (which is not uncommon on computers, and is for certain on Microsoft “Surface” tablets). The size inflation will get worse and worse in a back-and-forth email chain, soon becoming ridiculous. The signature code will be written in MS Word (a programming language unto itself) and not in standard HTML, thus resulting in potential rendering problems in non-Outlook environments - Gmail, Mac Mail, iOS, Android, etc. These will occur. The other thing, that I’ve seen occur in too many cases, is that the logo and other graphics will somehow not be available to the recipient. The sender will see them perfectly, and thus not realize that anything’s wrong. To the recipient however, they simply aren’t there. I’ve never pursued the cause of this problem, for the simple reason that signature should never be created in MS Word in the first place. Above the arbitrary threshold of 50 users, populating the signatures (and managing change requests) manually really isn’t feasible. This is where the use of an outside vendor specializing in email signature management becomes necessary. Most of the software in the email signature arena utilizes the same approach to signature population - it pulls the data from what’s called “Active Directory” (or AD for short). Active Directory is a database provided by Microsoft as an integral part of Windows Server operating systems, and is commonly used to store employee data - most specifically as it relates to individual email accounts. There are certainly advantages to pulling the individual user’s data (name, email address, title, phone number, etc.) from Active Directory, the biggest of which is that it is (presumably) already in existence. So, with a well maintained Active Directory, and a properly configured email signature software program, you basically “flip a switch” and voila, you have email signatures for everyone. There are two potential downsides to using Active Directory to populate the email signatures. First, your company’s Active Directory may not be well maintained. I’ve seen many cases where it is populated with the minimum required data, which is basically the person’s name and email address. And even in this case, it may be messily populated with names like raYMOND CARR or r carr. Neither of those is going to be appropriate when ported over to an email signature. Removing potential data elements from an email signature program is one way of dealing with non-existent Active Directory data. Unfortunately, the result is always a signature that is less than desirable. If you’re not willing to cut corners on the scope of your email signature program, then an alternative data source needs to be found. The alternative is manual entry. Items on the above list, while not available from Active Directory, are readily available to the signature owner themselves, and indirectly available to a colleague (Human Resources or Marketing) of the signature owner. So, a well-constructed data entry portal becomes an efficient way of populating the email signature data. Ideally this manual entry process will be made a simple as possible, thus enabling individual signature owners the ability to do it themselves, without mistakes and without consternation. In some cases, the manual entry process can be supplemented with an automated data feed process. When we take on large clients we often upload a spreadsheet of employee data at the outset of the project to jump-start the signature creation process. For example, by uploading an employee spreadsheet we can pre-populate 3000 signatures. At that point, individual users can modify their signatures as needed, utilizing allowable options within the email signature program such as adding their photo, or personal tagline, via our portal. Corrections can also be easily made if needed. Over the years, it has been my experience that the direct entry of email signature data, by end users themselves, is a tremendously efficient approach to the challenge of signature data population. Furthermore, providing direct user access to edit the signature data is tremendously efficient going forward, as it empowers individuals to perform their own signature management, rather than having to go through someone else. To follow-on in regards to the last point, it would seem that future edits to a user’s email signature could easily be performed simply by accessing the signature edit dialog in the user’s email program. While true that edits can be performed here, there are two or three compelling reasons why they should not be. In Microsoft Outlook 2013 and newer, any user edit at all (e.g. simply adding your middle initial to your name), made in Outlook’s signature edit window will cause images to become “embedded” rather than being delivered from the server. The result will be pixelization, possible enlargement, and unwanted attachments cropping up in email. A good email signature will contain a fair amount of coded HTML formatting. While the formatting code resides behind the scenes, out of a user’s sight, overzealous use of the backspace key or delete key during WYSIWYG editing can easily break the formatting. Sometimes the result is not visibly apparent, but nonetheless the damage has been done - for example, broken hyperlinks are often found in user edited signatures. If the email signature program in use is tied into an automated synchronization protocol, any local edits a user makes from within their email signature program will be overwritten each time synchronization occurs. It is important that proper protocol be followed when it comes to the ongoing edits email signatures inevitably require. When a company-wide email program - Outlook, Gmail, etc. - is in use, the deployment process is simplified somewhat. One approach, whether it be automated install or manual install, will suffice for everyone. This, however, is not the case as frequently as it used to be, primarily due to the split use of computers and mobile devices by many people. Microsoft Outlook: Complicated manual install - requires the placement of three signature files in the proper Windows folder, followed by the setting of defaults within Outlook’s signature dialog. Trust center configurations may also be required. Fortunately, most email signature vendors provide automated installation approaches. Office 365 / OWA: Easy copy-and-paste manual install. Many automated install approaches also offered by vendors. Gmail: Easy copy-and-paste manual install. Some automated install approaches also offered by vendors. Mac Email Programs: Moderately complicated manual install processes, further complicated by the necessity to avoid the use of the Safari browser and the generally poor support for email signatures provided by Mac-based email programs. iPhone / iPad: Somewhat unintuitive manual install process - copy-and-paste with unfamiliar intermediate steps required. Some automated install approaches also offered by vendors. Android Devices: These do not support the use of HTML email signatures. None of the approaches to manually installing an email signature are overly complex, and so to a technically competent user with proficiency in copying and pasting, saving files to a disk and then locating them, opening folders, and navigating configuration menus, the one-time manual installation process should generally take 2 and 5 minutes. Less technically competent users may balk at an instruction set that asks them to do ten things sequentially, and thus struggle with, or abandon, the manual installation process. User motivation plays a role here to - if the user wants to successfully install the signature, they almost always can do so successfully. Deploying automated signature installation software across the enterprise, ensuring that all (or most) of the email signatures are automatically deployed to end-users, with little or no direct involvement by the end-users themselves. Manual intervention as needed - physically (or remotely) accessing a person’s computer and doing (or assisting with) the install. Help Desk support - providing telephone support to end users as needed. Any one of these three will greatly enhance the process of rolling-out, and maintaining, a companywide email signature program. A change to regulations pertaining to disclosures and licensing information. Special one-year only branding celebrating a 10/25/50 year anniversary. Winning an award or achieving a milestone that you want reflected on your signatures. Changes to subsets of your signatures typically revolve around address changes, the opening of new branches or divisions, or the acquisition of another company. Some of these changes will require modifications to your signature HTML code, while others will simply be text / database updates. Either way, proper up-front planning for the necessity for various changes over time will pay dividends as your program matures. There are differing schools of thought when it comes to leveraging email signatures for the purposes of marketing campaigns. Before discussing this topic, I think it’s good to step back for a moment and look at what an email signature is, and what it isn’t. An email signature is: An email signature is a block of content applied to the bottom of every email message, sent for every purpose, and potentially to anyone. Its primary purpose is to give the recipient a snapshot of who the sender is and to enable them to make contact in a variety of ways. It is, in essence, an electronic business card. An email signature is not: An email marketing campaign or an advertisement. Announce appearances at trade shows and conferences and provide people with a link to a registration page of some sort. Announce training seminars and / or webinars, and again provide people with link to a “sign up” page. Announce pending (and just completed) office moves - bringing people’s attention to the new address. Announce a recently won award or accolade. Announce a company acquisition or a new product line. What stands out about these is that they fall into the category of “announcements” rather than “campaigns”, and as announcements, measurability is irrelevant. The ability to leverage an email signature program for the purposes of making timely announcements to the random mix of people who will see your company’s email signatures is valuable. 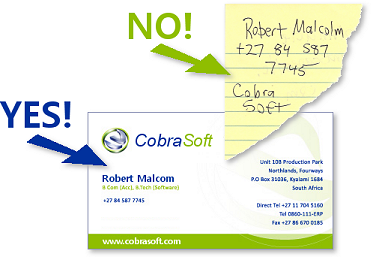 However, viewing your email signature program as a new marketing platform is, in my opinion, a mistake. As much as you might like it to be a new marketing platform, it probably never will be one, or at least not an effective one. As you can see, properly executing an email signature program is not an insignificant task. It is, however, an extremely important one. With your commitment, and use of the right outside resources, the process should go smoothly, culminating in tangible results. As I said earlier, the cumulative effect begins immediately upon launch of a well-crafted professional email signature program, and never stops!